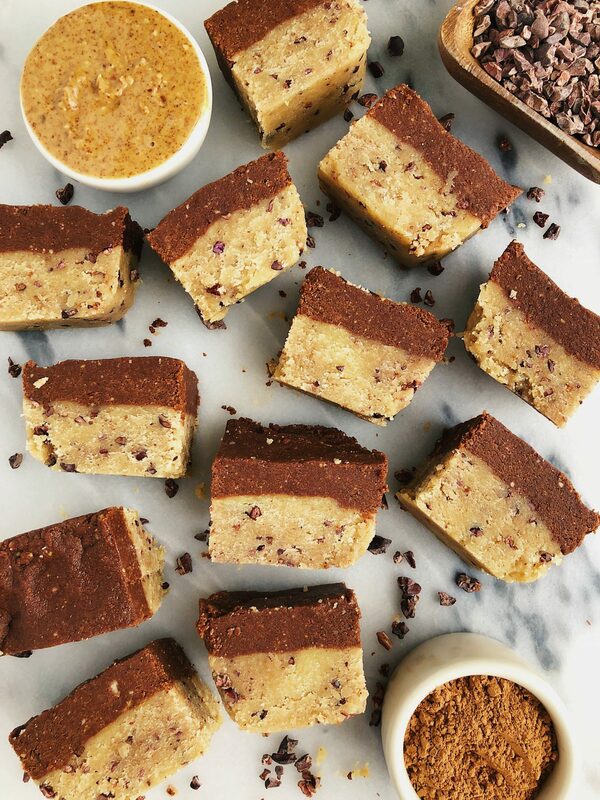 Healthier Chocolate Cookie Dough Fudge Bars made with vegan and gluten-free ingredients for an easy no-bake dessert! Healthier Chocolate Cookie Dough Fudge Bars, I love you so much. These are made with simple ingredients like nut butter, almond flour and creaminess and flavor from REBBL. My obsession with all things REBBL grows with each bottle if that is even possible. I not only am in love with their elixirs and protein beverages and the delicious flavors infused with adaptogens offered, but also the brand as a whole. Who REBBL is as a company, makes me so proud to be a consumer of theirs and to collaborate on them here on the blog. As many of you know, April is Earth Month and I want to take this as an opportunity to tell you some about why I love REBBL and their brand. They have such an amazing impact story and REBBL celebrates the idea of being Rooted in Purpose. They are celebrating this all month long with social media giveaways, different activations in the space and more. Not for Sale: REBBL was founded out of a non-profit to help create a future without human trafficking. 2.5% of net sales supports Not for Sal. Impact sourcing: implementing REBBL’s Supplier Code of Conduct that helps to mitigate the risk of exploration in their supply chain. They are able to give jobs to many by where they are sourcing their ingredients from. REBBL uses the most exotic ingredients that are sourced from all over the world. Climate: REBBL is also helping to address climate change through sustainable business practices that help to minimize our carbon footprint. REBBL recognizes the ripple effect climate change has on the supply chain. They are making an effort to help this issue through agriculture, policy, transportation, packaging forests and food-waste. 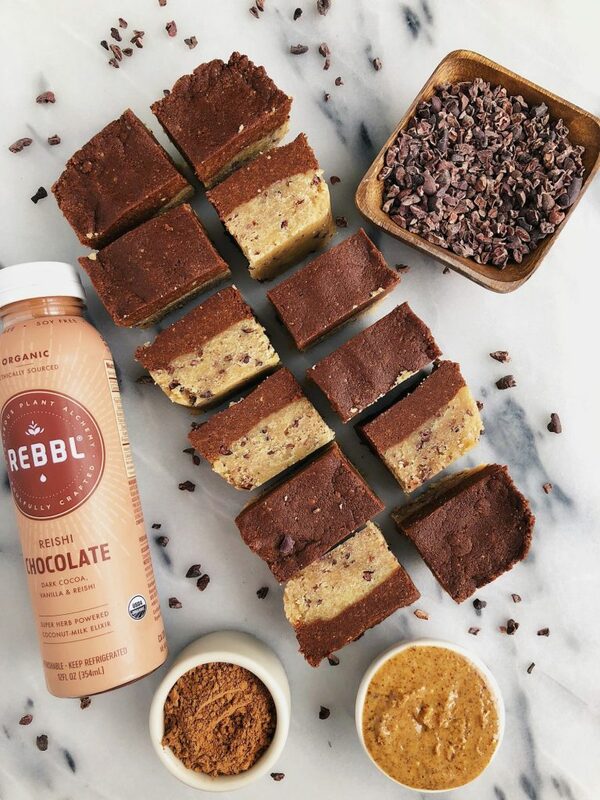 When you are making and eating these Healthier Chocolate Chip Cookie Dough Fudge Bars made with REBBL, you can feel even better than you are not only making yourself a dreamy dessert, but also helming to make a difference in more ways than you know by supporting REBBL. Thank you REBBL for sponsoring this post! It means so much to me to work with brands I love and believe in! Hi! I have an allergy to cashew butter – could I do another nut butter instead like almond or peanut? Made these with all almond butter (no cashew left!) and they came out AMAZINGLY good. I added in some pure almond extract because I’m an almond freak. And himalayan salt because gotta love my salty-sweet. I actually saw so many possibilities- will definitely make again and play with variations in the future! Hey Deanna! How much salt did you use in your recipe? A salty-sweet flavor sounds so good right now! Hi! Could it be made without a food processor? Would a blender work or hand mixing it? Thanks! They look delicious. hmm i haven’t tried! definitely not by hand. and depends on the strength of the blender! I made these last night with a few modifications and they turned out great! I didn’t have any cashew butter so I swapped for natural peanut butter, also didn’t have cacao nibs but used Enjoy Life dairy free chocolate chips, I can’t get REBBL here in Calgary, Alberta so I used unsweetened almond milk instead. They look just like the pictures in the recipe, and tasted exactly how you would imagine….cookie doughy with a fudgy chocolate top! YUMMY!